The American index typewriter is one of the most commonly found early index typewriters. It was introduced in 1893 and appeared in two versions. The first and most rare version had a smaller shield over the swinging sector that holds the rubber type, resulting in stained sleeves when writing. The upgraded machine, shown here, has an extended shield that provides better protection. On introduction the American cost 10 dollars, but the price was gradually lowered to 5 dollars. The American Index was also produced in Europe and appears as the Globe (made by Wilkinson in Britain), and Sterling. The American Typewriter Company also produced a cheap sheet metal 'visible' typewriter. 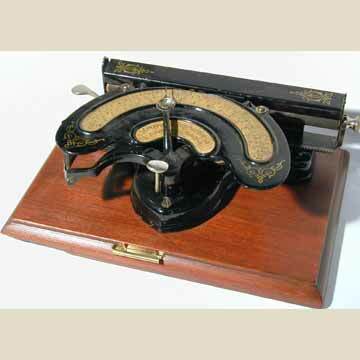 In 1901 it introduced an upstrike keyboard typewriter. See the book TYPEWRITER, page 153.